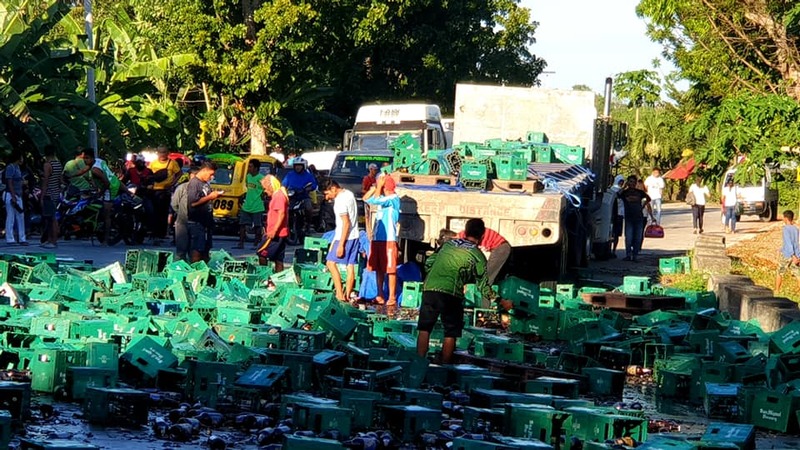 Cases of beer and broken bottles litter a section of the highway in North Cotabato after spilling from a cargo truck on Wednesday (January 16). Photo courtesy of North Cotabato Vice Governor Shirlyn Macasarte-Villanueva who found herself delayed by the event and posted the pictures onto Facebook. 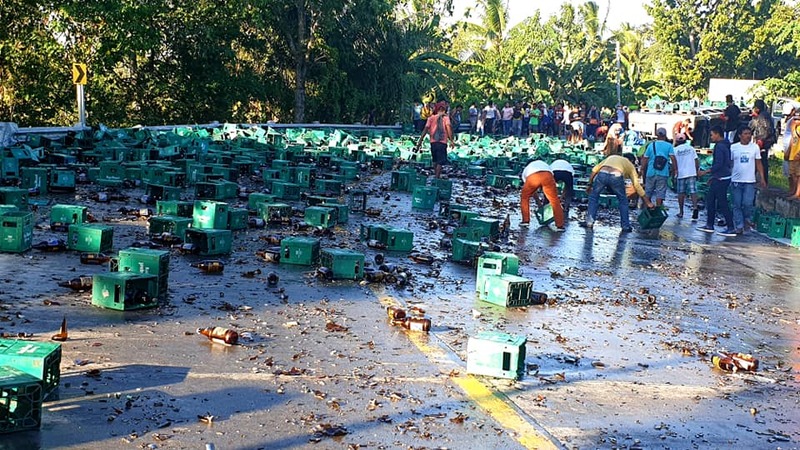 A section of road between Cotabato City and Davao City was blocked after hundreds of cases of San Miguel beer fell off the back of a truck. The governor was travelling to Midsayap town from Kidapawan City when she noticed stranded vehicles and people milling around a cargo truck at about 4pm on Wednesday (December 16). Her photographs of the scene show green San Miguel crates almost completely covering the highway from one side to the other. It is unclear whether these people are villagers searching for intact bottles, or locals helping with the clear-up of the mess. Ernie Saban, a local resident, said he saw the cargo truck heading to Cotabato City from Davao City. He described how it was negotiating a downward curve in Barangay Bagolibas, Aleosan, when the cases of beers became unbalanced and fell. “The bottles were broken causing a halt to traffic flow,” he told the Philippine News Agency. “We tried to salvage unbroken bottles but were prevented by police.” However, he added that several villagers had succeeded in making off with some intact cases of beer. An initial police investigation has found that a piece of rope strapped around the cargo hold of the open-back truck had snapped, causing the spillage. Traffic was reopened an hour later after local volunteers had cleared the highway of the crates and broken glass.